The project not only had environmental aims but was also capacity-building, giving Traditional Owners the opportunity to work back on Country. The Wanyarram Dhelk project, meaning “good waterhole” in the local Aboriginal language, is a collaborative project between Traditional Owners from the Dja Dja Wurrung community and North Central Catchment Management Authority. The Bendigo Creek Streamside Reserve, although highly modified, is a valuable linear reserve providing significant habitat, recreational and aesthetic value to a rapidly developing community. Bendigo Creek also serves as an important biodiversity link, with many of its tributaries connected to the Wellsford State Forest and Greater Bendigo National Park. The project seeks to implement aspirational goals outlined in the Dhelkunya Dja Country Plan by establishing a mentoring and work experience program with key government partners for high school aged Dja Dja Wurrung and other Aboriginal students. Collaborating with multiple stakeholders provides an opportunity to rejuvenate community connection to waterways and emphasise the strong connection between the creek and local indigenous communities. Creek restoration will improve public amenity and enhance the ecological value of the waterway. Improving waterway health is important economically and culturally and provides community health and wellbeing outcomes. For example, the cooling benefits of the creek will provide resilience to future climate change. 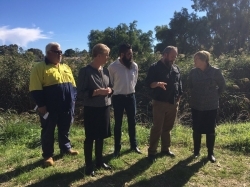 With the assistance of the Dja Dja Wurrung community the Bendigo Creek restoration project provides opportunities for ongoing jobs and training that provide ecological outcomes for the creek. This is a joint project between by Dja Dja Wurrung Enterprises and North Central Catchment Management Authority. 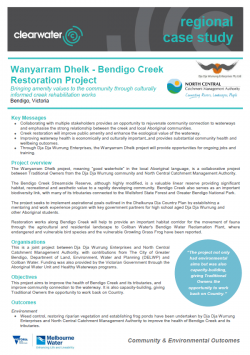 The City of Greater Bendigo, Department of Land, Environment, Water and Planning (DELWP) and Coliban Water have also contributed to Wanyarram Dhelk. This project was supported by the Victorian Government's Second Generation Landcare Grant program and Victorian Landcare Grants program distributed via the North Central Catchment Management Authority.